Wiseman Wine Adult Men Costume;RG Costumes & Accessories is one of the world's largest manufacturers and suppliers of costumes accessories seasonal decor and supplies in the costume industry. The attention to detail and quality of material used in manufacturing each product make this beautiful line even more attractive. The line of the product is designed by skilled and experienced costume designers and is then manufactured by a team of leading professional tailors. 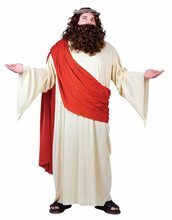 Burgundy Wiseman Adult Men Costume;This burgundy biblical wiseman costume is perfect for any Christmas Play, Nativity or Holiday function. Biblical Times Wiseman Burgundy ] Biblical Times Wiseman Burgundy Fits Up To A Chest Size 42. Includes Headpiece, Robe and Belt. Deluxe Wiseman Adult Costume.Includes: Tunic, headband and belt.Available Size: One Size Fits Most Adults. 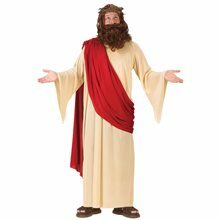 *Sandals Not Included.Complete your nativity or Christmas play with this Deluxe Wiseman Adult Costume! A great way to get in the holiday spirit of giving.